Experiment with our Roasted Pumpkin Seed Recipe rather than store bought seeds. 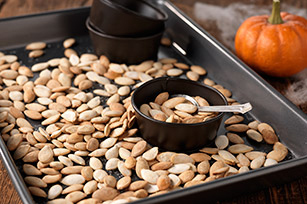 Make the most of your jack-o-lantern with our Roasted Pumpkin Seed Recipe. Rinse seeds; discard any stringy membranes. Spread seeds into single layer on baking sheet. Let stand 3 hours or until dried. Heat oven to 350°F. Spray seeds generously with cooking spray; sprinkle with salt. Bake 8 to 10 min. or until lightly browned, stirring after 5 min. Carve a pumpkin with your children and then have fun making this special recipe. A serving of pumpkin seeds is 1/4 cup. Prepare as directed, omitting the salt and choosing one of the following flavorings to toss with each 1/2 cup pumpkin seeds before roasting. Spicy: 2 tsp. GOOD SEASONS Dressing Mix. (Try Italian, Cheese Garlic or Asian Sesame Flavor.) Sweet: 2 tsp. maple syrup and 1/2 tsp. ground cinnamon. Increase baking time to 8 to 10 min. or until golden brown. Cool in pan. Break apart if necessary. Cheesy: 4 tsp. KRAFT Grated Parmesan Cheese. Make all the different flavors and serve at your next Halloween party. When buying your pumpkin, make sure it has a level bottom and one smooth unblemished side for the jack-'o-lantern's face. Children can take part by drawing the jack-'o-lantern's face with a permanent marker before the adult cuts it out. Store the pumpkin outside until it is ready to be carved. Makes 8 servings, 1/4 cup each.